Public funding for sports events was a fact of life for the Greeks and Romans. So was private funding, and both the Greeks and the Romans knew what the benefits and what the pitfalls associated with either might be. Can we be certain that the organizers of the London Olympics are quite so clear about this? The widely advertised donation (amounting to thirty-one million dollars) by pharmaceutical giant GlaxoSmithKline (GSK) of testing facilities for 6,250 blood samples taken from athletes (testing for 62% of contests, up from 45% at Beijing) could raise that question. The Olympic Committee, while a private organization, works hundreds of governments that provide public funds for Olympic sports and must regulate GSK’s products. The fact that GSK has recently offered to pay a three billion dollars settlement to one of three governments that doesn’t provide public funds to its Olympic athletes (that of the United States) for deceptive advertising might make people wonder about the definition of “drug cheat” at these games. 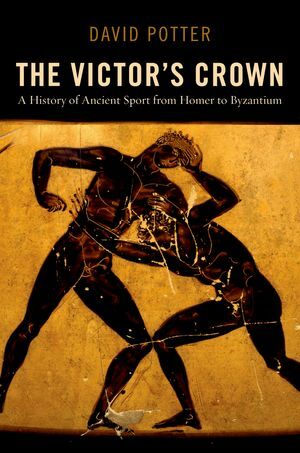 The Ancient Greeks, by and large, tended towards the use of public funds for major athletic events. Even before they developed the western world’s first system of coinage, they were aware of the impact of wealth on public decision-making. The first reference to bribery occurs in one of the earliest Greek poems, and one of the earliest surviving documents from the ancient Olympic games indicates deep concern about shady financial transactions on the part of the bigwigs who were in attendance. The city of Elis, in whose territory Olympia was located, paid for the administration of the games (a colossal pain in the neck then as now). Elis appointed a board of officials every four years to make sure everything worked. The board advertised the games, appointed the officials, oversaw the training of the athletes before the opening ceremonies to make sure that the competitors were legitimate, and made sure that the facilities were in decent shape. Since venues like stadium were only used every four years, there was always a lot of deferred maintenance. We have a fascinating document, albeit connected with another major festival, detailing payments an organizing committee was making to local contractors to do things like clean trash out of the venues, provide the best surfaces, and so forth. Big spenders from elsewhere were always welcome. In time, some of them did build splendidly self-commemorative structures at the site of the games, but those buildings were never central to the games themselves. They tended instead to cater to the needs of fans who were by and large drawn from the class of people who could afford to take a few weeks off work to go to the games. Elis never sold naming rights to the stadium and made it clear that the rich and powerful, even if sponsoring athletes (often the case) weren’t connected with the way the games ran. The Romans took the opposite approach. Quick to recognize the political benefits of a good show, Roman politicians moved away from a publicly-funded model of entertainment, which existed for hundred of years in conjunction with chariot racing, to a private model at about the same time that Rome became the dominant power in the Mediterranean World (the end of the third century BC). From then on the rise in privately funded spectacles tracks very closely the transformation of Rome from democracy to autocracy. The corrosive effect of private funding model becomes immediately clear when we see a staunch defender of the traditional political system (Marcus Cicero) in the business of hiring out gladiators to other politicians and receiving extensive correspondence from a friend about the importance of providing some panthers for games that he will put on. If only Cicero, then governor of a province where the desired beasts resided, would hurry up and catch a few! Cicero himself noted that the massive spectacle put on by one of Rome’s aspiring autocrats failed because the events were either too familiar, or, in the case of the slaughter of some elephants, too distressing. The man who ultimately brought the Roman democracy crashing down, Cicero’s contemporary Julius Caesar, was a major gladiatorial contractor who made many friends by helping people fund things that they couldn’t afford. There may perhaps be no more powerful statement of the linkage personal funding of sports events and non-democratic government than one of Rome’s most important monuments. The building we know as the Colosseum was actually built as “The Flavian Amphitheater,” named for the family of the emperor who paid for it with the money he took from the destruction of Jerusalem in 70 AD. The Olympic movement provides amazing spectacles, drawing the world together just as the ancient games once did. It gives athletes the chance to excel on a unique stage and us a chance to watch astonishing achievements in awe. At the same time we need to be conscious, as the original founders of the games were, of where the money comes from and just what is being bought. I never thought I’d see “publically” in the Oxford University Press blog!